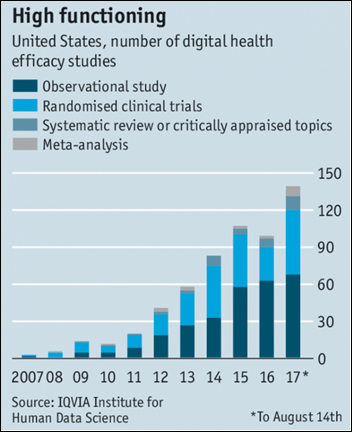 Apps are being approved to actually treat conditions – either alone or in combination with a drug – but investors are watching to see how companies fare since the “who pays” question hasn’t been answered and nobody’s sure how a patients will react to being given an app instead of a pill. Pear Therapeutics won FDA approval in September 2017 for its ReSet app for substance abuse treatment. Its pipeline includes apps for schizophrenia and post-traumatic stress disorder. The Boston-based company, founded by neuroscientist Corey McCann, MD, PhD, raised $50 million in a Series B funding round last month that increased its total to $70 million. From Eloquent Rascal: “Re: Apple Health Records. Does it display any information that patients can’t already see in their EHR portal? Can patients change the information?” A source tells me that, so far anyway, the patient’s phone will show consumers nothing that they can’t already see on the patient portal. Patients can apparently change or hide information, which makes their phone-stored information of limited use to clinicians who may not trust it. My poll tool doesn’t calculate percentages like you might expect when allowing multiple choices, but it’s safe to say that most respondents use their phones for health-related activities. 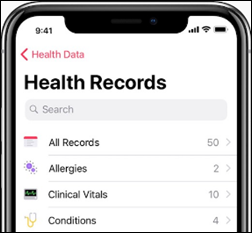 Relatively few, however, use the information contained on it during their provider visit, view their progress notes via OpenNotes (although that obviously requires their hospital to participate), or seek out a video visit. New poll to your right or here: if you’re going to the HIMSS conference, why? I received a few responses to What I Wish I’d Known Before … Bringing an Ambulatory EHR Live. Let’s hear what you have to say about the reader-recommended topic of taking a software sales job. CEO Jonathan Bush says the company is seeing a post-HITECH “sugar low” as overall buying demand slacks off. Bookings for the fiscal year didn’t meet the company’s goal. The company will change its software release schedule to three times per year following disappointing customer retention numbers. 62 hospitals are fully live on its inpatient system. 40 percent of customers are exchanging patient records via CommonWell and Carequality. Bush says the they can see hospital CCD information on an application tab, but the next steps involve extracting the most useful information and then developing APIs to allow users to interact directly with a hospital’s EHR. The company’s main strategy will be to deepen the number of services offered to mitigate the “micro aggressions against the practice of medicine” and to emphasize its network’s capabilities rather than assuming that offering the best EHR or PM will create demand. Bush says the previously “clunky” single, integrated view of inpatient and outpatient patient records view is improving as the company hopes to avoid being “boxed out” in being replaced by a single integrated system such as Epic or Cerner. Epocrates continues to turn in poor numbers, although it’s no longer being positioned as a standalone product but instead as a dashboard for other Athenahealth offerings. The company spent a lot of money and annoyed doctors as it fought to get a significant share of HITECH-driven business, but now it is transitioning to more thoughtful product offerings. Bush says high-deductible insurance has pushed patients to defer services until later in the year when they’ve met their deductible, with providers and their vendors facing lean first quarters as the new normal. 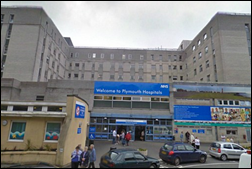 In England, Plymouth Hospitals NHS Trust joins the global health research network of TriNetX. Adirondack Medical Center Saranac Lake (NY) went live with Meditech in November 2017. St. Luke’s Gnaden Huetten campus (PA) will switch from Cerner to Epic in June 2018. St. Vincent Hospital (PA) will replace McKesson with Epic in February 2018. Investment syndicate AngelMD hires industry long-timer Michael Raymer (Perspectum Diagnostics) as chief strategy officer. A GAO report finds that federal and state governments are spending $10 billion for assisted living services for Medicaid beneficiaries without much oversight or quality monitoring. It concludes that CMS has provided unclear guidance, Congress has not established standards, and states haven’t tracked cases involving neglect or abuse. “As a family, we don’t get it,” an apt description from a man convinced that he got the flu more often in years when he got a flu shot. Canada’s Royal Canadian Mounted Police reverses its decision to require officers to file an Access to Information Act to get copies of their own medical records after being overwhelmed by requests and complaints about delays. The 30,000-employee RCMP has 65 people working in its access-to-information and privacy office, which scanned 1.2 million pages of documents last year. Documents requested under the Access to Information Act have to be printed from their electronic original and shipped to the access and privacy office in Ottawa, where they are then scanned back in. An NHS surgeon who claimed in a job interview to have performed over 50 solo keyhole surgeries vs. his real-life total of six says he didn’t understand the question and instead gave a “guesstimate.” He got the job after submitted a fraudulently completed surgery logbook, but was investigated after a high incidence of post-surgical complications and death. He’s been found guilty of fraud. T-System will provide its T-Sheets flu templates to EDs and urgent care centers at no charge. Santa Rosa Consulting adds e-learning capabilities to its Meditech offerings. Surescripts will exhibit at the NACDS Regional Chain Conference February 4-7 in Fort Lauderdale, FL. Flu shots? If so effective why do so many catch it? I.S. Has 5% of global population but consumes 85% of all prescription drugs. Something is off kilter here. Seatbelts? If so effective why do so many die in car accidents. “patients to defer services until later in the year when they’ve met their deductible” May be true but how is that rational? I suspect that as the new year starts most patients don’t have intentions of meeting their deductable. Maybe it’s not rational, but necessary? If someone living paycheck to paycheck can’t fork up the money for their entire deductible in Q1, they have to spread that out and then get the services they need? Because they can afford a series of small payments over the course of the year, but they can’t afford a $1500 bill that’s due on the date of service. 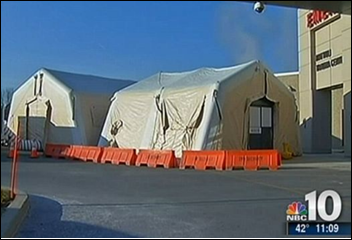 RE: record-breaking numbers of flu-related ED visits and admissions…..sure wish there was a way to keep people who don’t get the flu shot from frequenting public places like their work place, gyms, airlines, schools, churches, well, really anywhere that the rest of us who DO get the flu shot frequent! I, too, have heard every one of those lame excuses from folks are fairly uninformed. And unfortunately, employers don’t help much when they don’t discourage people from coming to work sick. It just keeps the whole vicious cycle going! It is worrisome that this year’s flu vaccine is now not even 30% effective, but I will say that I’ve never gotten the flu since I started getting a shot. And that was the year after I actually did get the flu. I sure hope my ‘luck’ holds this year, too! I do think many people confuse the true ‘flu” with other cooties they catch out there. Maybe there needs to be an education campaign to explain to people what the flu is. I have to think the majority of people saying they got the flu shot then got the flu really got a flu shot and then got a cold.